The Kershaw Black Gulch 3120W has appealing hardwood inlays that contrast nicely with the satin finished bolsters. 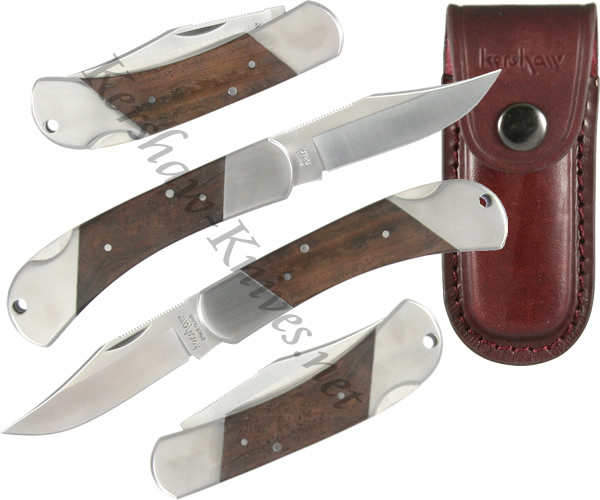 The blade is a straight edge clip point with a notched thumb rest on the ridge. The blade is made out of 8Cr13MoV and has a traditional nail nick for opening. The blade locks into place with a lockback mechanism. A leather case is included to store and carry the Kershaw Black Gulch 3120W.